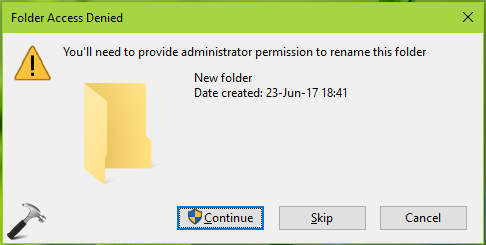 This article will help you to fix "You’ll need to provide administrator permission to rename this folder" message in Windows 10/8.1/8/7. We all know that whatever operation we perform with the files and folders on Windows, we are required to have mandatory permissions for doing those operations. So if we don’t have the required permissions on our profile, we can’t rename, move, copy or delete any file or folder. This article talks about one such issue, where due to lack of permissions, you can’t modify any file/folder. We recently faced this problem on one of the Windows 10 Pro machine we’ve. You’ll need to provide administrator permission to rename this folder. You’ll need to provide administrator permission to delete this folder. You need to signed in as administrator to perform below mentioned steps. 1. Right click on the concerned file/folder and select Properties. 2. On the file/folder property sheet, switch to Security tab. Click on Edit button there. 3. Next, on the Permissions sheet, under Group or user names, select your user account. Then uncheck the tick marks for all of option for Deny, under Permission for <your account>. In other words, you’re here removing the restriction to operate file/folder for your account, by keeping the Allow option activated. Click OK and close the property sheet this way. Now retry to perform the rename/delete/copy/move operation for the same file/folder and this time the error should not occur.